My first job in the natural health industry was as a sales clerk in a health food store. A desire to sell dietary supplements and health foods wasn’t the underlying reason why I chose this line of work. It’s true that I needed to earn money. But I could have made more working as a tutor, waiter or at countless other jobs. Looking back, I now understand that the reason I selected this path was in order to have some face-to-face time consulting with customers. I knew what it was like to be a consumer asking for guidance at health food stores. Since I was often disappointed with those experiences, I subconsciously decided to correct that flaw via my own conduct as a health store employee. Minerva Urol Nefrol. 2014 Dec;66(4):217-23. Sperm quality in men is improved by supplementation with a combination of L-arginine, L-citrullin, roburins and Pycnogenol®. The aim of this study was to investigate the influence of Prelox®R, a combination of French maritime pine bark extract (Pycnogenol®), L-arginine, L-citrulline and roburins, on male fertility. Sperm quality of 50 subfertile men was tested in monthly intervals in a double-blind, randomized, placebo controlled, crossover study. Patients received 2 tablets Prelox®R or placebo twice daily during test periods. Following a run-in period of 1 month, patients received either Prelox®R or a placebo for 1 month. After a wash-out period of 1 month, patients received Prelox®R or a placebo in a crossover manner for 1 month. Sperm volume, concentration of spermatozoa, total count, motility, vitality and morphology were measured by standard methods of calculation of the Fertility Index (FI) in monthly intervals. Activity of e-NOS in sperm was evaluated in parallel by measuring the quantity of L-citulline produced from L-arginine. Supplementation with Prelox®R enhanced sperm volume and concentration, motility, vitality and morphology significantly versus placebo. The Fertility Index rose to normal values during treatment with Prelox®R. e-NOS activity in sperm was elevated by Prelox®R. No adverse effects were reported. Prelox®R offers a safe method to improve quality of human spermatozoa in subfertile men. Erectile dysfunction is a man’s persistent or recurrent inability to achieve and maintain erection for a satisfactory sexual relationship. As diabetes is a major risk factor for erectile dysfunction, the prevalence of erectile dysfunction among diabetic men has been reported as 35% to 90%. This randomized, parallel-group, double-blind, placebo-controlled trial investigated the effects of a topical saffron (Crocus sativus L) gel on erectile dysfunction in diabetic men. Patients were randomly allocated to 2 equal groups (with 25 patients each). The intervention group was treated with topical saffron, and the control received a similar treatment with placebo. The 2 groups were assessed using the International Index of Erectile Function Questionnaire before the intervention and 1 month after the intervention. Compared to placebo, the prepared saffron gel could significantly improve erectile dysfunction in diabetic patients (P < .001). This preliminary evidence suggests that saffron can be considered as a treatment option for diabetic men with erectile dysfunction. J Appl Physiol (1985). 2015 May 28:jap.00192.2014. L-citrulline supplementation improves O2 uptake kinetics and high-intensity exercise performance in humans. The purpose of this study was to compare the effects of L-citrulline (CIT) and L-arginine (ARG) supplementation on nitric oxide (NO) biomarkers, pulmonary O2 uptake (VO2) kinetics and exercise performance. In a randomised, placebo-controlled, cross-over study, ten healthy adult males completed moderate- and severe-intensity cycling exercise on days 6 and 7 of a 7 day supplementation period with placebo (PLA), 6 g•day-1 of ARG and 6 g•day-1 of CIT. Compared to PLA, plasma [ARG] was increased by a similar magnitude with ARG and CIT supplementation, but plasma [CIT] was only increased (P<0.001) with CIT supplementation. Plasma nitrite concentration ([NO2 -]) was increased with ARG (P<0.05), and tended to increase with CIT (P=0.08), compared to PLA (PLA: 83 ± 25, ARG: 106 ± 41, CIT: 100 ± 38 nM); however, mean arterial blood pressure was only lower (P<0.05) after CIT supplementation. The steady state VO2 amplitude during moderate-intensity cycle exercise was not significantly different between supplements, but CIT speeded overall VO2 kinetics (PLA: 59 ± 8, CIT: 53 ± 5 s; P<0.05) during severe-intensity exercise, improved tolerance to severe-intensity exercise (PLA: 589 ± 101, CIT: 661 ± 107 s) and increased the total amount of work completed in the exercise performance test (PLA: 123 ± 18, CIT: 125 ± 19 kJ; P<0.05). These variables were not altered by ARG supplementation (P>0.05). In conclusion, these results suggest that short-term CIT, but not ARG, supplementation can improve blood pressure, VO2 kinetics and exercise performance in healthy adults. J Int Soc Sports Nutr. 2015 Jun 10;12:27. Combined L-citrulline and glutathione supplementation increases the concentration of markers indicative of nitric oxide synthesis. BACKGROUND: Nitric oxide (NO) is endogenously synthesized from L-arginine and L-citrulline. Due to its effects on nitric oxide synthase (NOS), reduced glutathione (GSH) may protect against the oxidative reduction of NO. The present study determined the effectiveness of L-citrulline and/or GSH on markers indicative of NO synthesis in in vivo conditions with rodents and humans and also in an in vitro condition. METHODS: In phase one, human umbilical vein endothelial cells (HUVECs) were treated with either 0.3 mM L-citrulline, 1 mM GSH (Setria®) or a combination of each at 0.3 mM. In phase two, Sprague-Dawley rats (8 weeks old) were randomly assigned to 3 groups and received either purified water, L-citrulline (500 mg/kg/day), or a combination of L-citrulline (500 mg/kg/day) and GSH (50 mg/kg/day) by oral gavage for 3 days. Blood samples were collected and plasma NOx (nitrite + nitrate) assessed. In phase three, resistance-trained males were randomly assigned to orally ingest either cellulose placebo (2.52 g/day), L-citrulline (2 g/day), GSH (1 g/day), or L-citrulline (2 g/day) + GSH (200 mg/day) for 7 days, and then perform a resistance exercise session involving 3 sets of 10-RM involving the elbow flexors. Venous blood was obtained and used to assess plasma cGMP, nitrite, and NOx. RESULTS: In phase one, nitrite levels in cells treated with L-citrulline and GSH were significantly greater than control (p < 0.05). In phase two, plasma NOx with L-citrulline + GSH was significantly greater than control and L-citrulline (p < 0.05). In phase three, plasma cGMP was increased, but not significantly (p > 0.05). However, nitrite and NOx for L-citrulline + GSH were significantly greater at 30 min post-exercise when compared to placebo (p < 0.05). CONCLUSIONS: Combining L-citrulline with GSH augments increases in nitrite and NOx levels during in vitro and in vivo conditions. [7-OR]: L-Citrulline administration increases the arginine/ADMA ratio, decreases blood pressure and improves vascular function in obese pregnant women. OBJECTIVES: Maternal obesity significantly increases the risk of preeclampsia, but the mechanism(s) underlying this relationship are unknown. Asymmetric dimethylarginine (ADMA) is an endogenous inhibitor of nitric oxide synthase and an independent risk factor of cardiovascular disease. ADMA is significantly elevated in obesity and preeclampsia. Oral citrulline is readily metabolized to arginine, increases the arginine/ADMA ratio and is associated with improved vascular function. The objective of this randomized double blind placebo controlled trial was to investigate the effect of citrulline administration on vascular function in healthy obese pregnant women. METHODS: 24 healthy obese pregnant women were enrolled at 16 weeks gestation and randomized to 3g of L-citrulline/day for 3weeks or placebo. ADMA, SDMA, arginine, blood pressure, uterine artery resistive and pulsatility indices (RI & PI), and brachial artery flow-mediated dilation (FMD) were measured at baseline (enrollment) and 3weeks after enrollment. RESULTS: ADMA, arginine/ADMA, blood pressure, uterine artery RI and PI, and FMD were not different between groups at enrollment. Citrulline significantly increased the arginine/ADMA ratio compared to placebo treated obese women (308.1±166.7 vs. 163.0±41.3, p<0.05). Blood pressure was significantly lower among obese women treated with citrulline (108.1±4.2/65.8±6.6mmHg) compared to placebo controls (116.1±6.4/72.2±6.2mmHg, p<0.05). FMD (10.8±2.9 vs. 7.9±2.7, p=0.03) and uterine artery PI (1.03±0.05 vs. 1.20±0.07, p=0.03) were significantly improved following citrulline treatment. Blood pressure remained significantly lower at 35weeks gestation and pre-delivery among obese women treated with citrulline. Blood pressure was not different between groups 6-12months post-partum. CONCLUSIONS: Supplementation with citrulline for 3weeks during pregnancy significantly increased the maternal arginine/ADMA ratio in healthy obese pregnant women, and was associated with improved vascular function and persistently lower blood pressure. Citrulline supplementation during mid-pregnancy may reduce the adverse effects of obesity on vascular adaptation to pregnancy by increasing the arginine/ADMA ratio and nitric oxide bioavailability. Complement Ther Med. 2015 Oct;23(5):693-8. METHODS: Comprehensive electronic databases were searched from inception through October 2014. Randomized controlled trials investigating Tongkat Ali compared to placebo were included. Outcome of interest was the improvement of erectile dysfunction. The difference of changes from baseline of the outcome between Tongkat Ali and placebo was pooled using weighted mean difference (WMD). Methodological quality of included studies was assessed using Jadad’s quality scale and Cochrane’s risk of bias. Continued admiration for your constant monitoring and citation of research updates. Many thanks, Jacek! I appreciate your encouragement and support! l-Arginine Supplementation Alleviates Postprandial Endothelial Dysfunction When Baseline Fasting Plasma Arginine Concentration Is Low: A Randomized Controlled Trial in Healthy Overweight Adults with Cardiometabolic Risk Factors. BACKGROUND: Vascular endothelial dysfunction, the hallmark of early atherosclerosis, is induced transiently by a high-fat meal. High doses of free l-arginine supplements reduce fasting endothelial dysfunction. OBJECTIVE: We sought to determine the effects of a low dose of a sustained-release (SR) l-arginine supplement on postprandial endothelial function in healthy overweight adults with cardiometabolic risk factors and to investigate whether this effect may vary by baseline arginine status. METHODS: In a randomized, double-blind, 2-period crossover, placebo-controlled trial (4-wk treatment, 4-wk washout), we compared the effects of 1.5 g SR-l-arginine 3 times/d (4.5 g/d) with placebo in 33 healthy overweight adults [body mass index (BMI, in kg/m2): 25 to >30] with the hypertriglyceridemic waist (HTW) phenotype [plasma triglycerides > 150 mg/dL; waist circumference > 94 cm (men) or > 80 cm (women)]. The main outcome variable tested was postprandial endothelial function after a high-fat meal (900 kcal), as evaluated by use of flow-mediated dilation (FMD) and Framingham reactive hyperemia index (fRHI), after each treatment. By use of subgroup analysis, we determined whether the effect was related to the baseline plasma arginine concentration. RESULTS: In the total population, the effects of SR-arginine supplementation on postprandial endothelial function were mixed and largely varied with baseline fasting arginine concentration (P-interaction < 0.05). In the lower half of the population (below the median of 78.2 μmol arginine/L plasma), but not the upper half, SR-arginine supplementation attenuated the postprandial decrease in both FMD (29% decrease with SR-arginine compared with 50% decrease with placebo) and fRHI (5% increase with SR-arginine compared with 49% decrease with placebo), resulting in significantly higher mean ± SEM values with SR-arginine (FMD: 4.0% ± 0.40%; fRHI: 0.41 ± 0.069) than placebo (FMD: 2.9% ± 0.31%; fRHI: 0.21 ± 0.060) at the end of the postprandial period (P < 0.05). CONCLUSIONS: Supplementation with low-dose SR-arginine alleviates postprandial endothelial dysfunction in healthy HTW adults when the baseline plasma arginine concentration is relatively low. The benefits of arginine supplementation may be linked to a lower ability to mobilize endogenous arginine for nitric oxide synthesis during a postprandial challenge. Plant Foods Hum Nutr. 2019 Feb 12. Watermelon Juice: a Novel Functional Food to Increase Circulating Lycopene in Older Adult Women. Because of accruing oxidative stress with advancing age, older adults may benefit from increased dietary intake of lycopene, a lipophilic carotenoid with potent antioxidant properties. Yet, intake of dietary lycopene as well as circulating lycopene levels are known to decrease with aging. 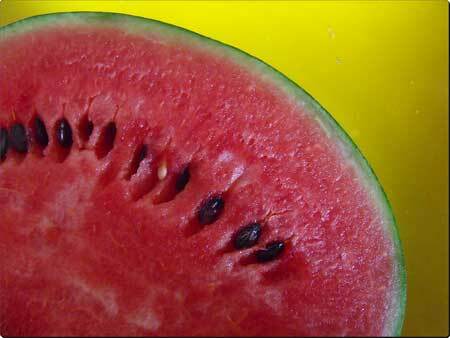 Watermelon is one of the few food sources of dietary lycopene. Because heat treatment increases lycopene bioavailability, ingestion of watermelon in pasteurized juice form may be an optimal delivery vehicle to increase lycopene levels in older adults. However, due to its lipophilic nature, there are concerns that co-ingestion of dietary fat may be necessary for efficient intestinal absorption of lycopene. Thus, this feasibility study aimed to examine the effects of a one-time dose of 100% pasteurized watermelon juice on circulating lycopene concentrations of postmenopausal women after a 10-h overnight fast. Blood was sampled from eight women before and 2 h after ingestion of 360 ml of juice, and serum lycopene was measured by ultra-high performance liquid chromatography. Circulating lycopene levels increased by three-fold (p < 0.001) with increases observed for every participant. Results demonstrate that 100% watermelon juice is a palatable, effective means of increasing serum lycopene in older adult women, a group at risk for low carotenoid intake.